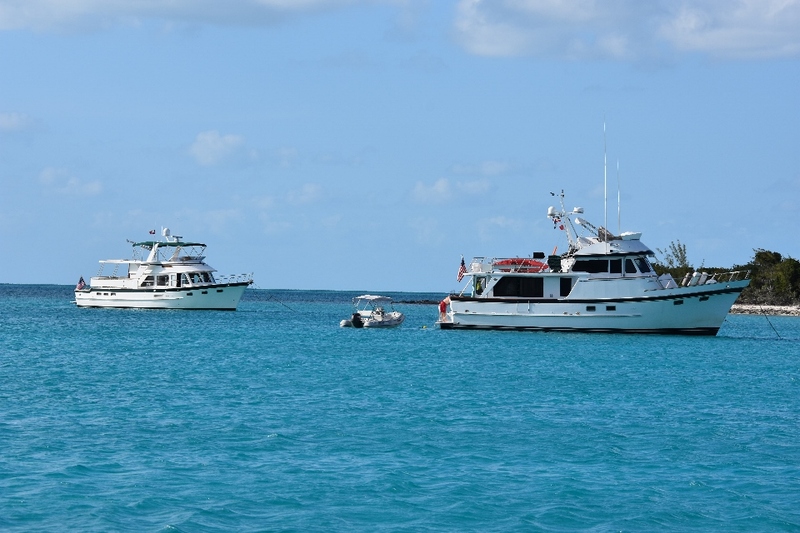 We left Emerald Rock and headed north to Hawksbill Cay. We had so liked the anchorage there we decided to return. We anchored right beside a nice 100+ foot yacht and watched the crew pamper their owners/guests. We also got an awesome opportunity to swim with some turtles that had come to inspect us! 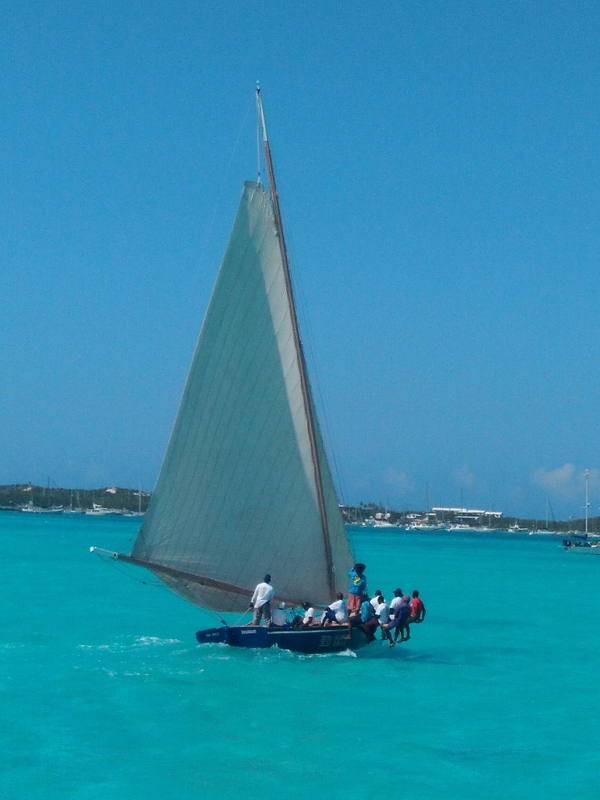 After two VERY relaxing days at Hawkbill we headed north again to Normans Cay. When we got out to the Exuma Bank and made our turn north the storm clouds rolled in with plenty of rain. We quickly headed below and ran the boat from the pilothouse*. We prefer to run the boat from the flybridge* as we have better all-around visibility, and it is easier to see the bottom, especially when navigating the shallows. Thankfully the storms had moved over before we made the turn east for Normans – which was a good thing because the approach to the anchorage was VPR*. The anchorage at Norman’s was wonderful. We were able to take Sonas practically up to the beach. We anchored just off the small resort there as we knew that there was a bar/restaurant there called McDuffs that we wanted to visit. Since we got there at lunchtime we decided to go in for lunch. When we got to the beach there was a sign saying that the restaurant was closed. But…. we are in the islands, so we decided to walk over to the restaurant and check. Of course it was open and they were happily serving lunch! We did tell them about the sign and they just shrugged! Norman’s used to be the headquarters for a large Medellin Cartel drug smuggling operation, with lots of bribes to local police and officials to turn a blind eye. In fact there is one of their planes still sitting in the shallow water where it crashed. 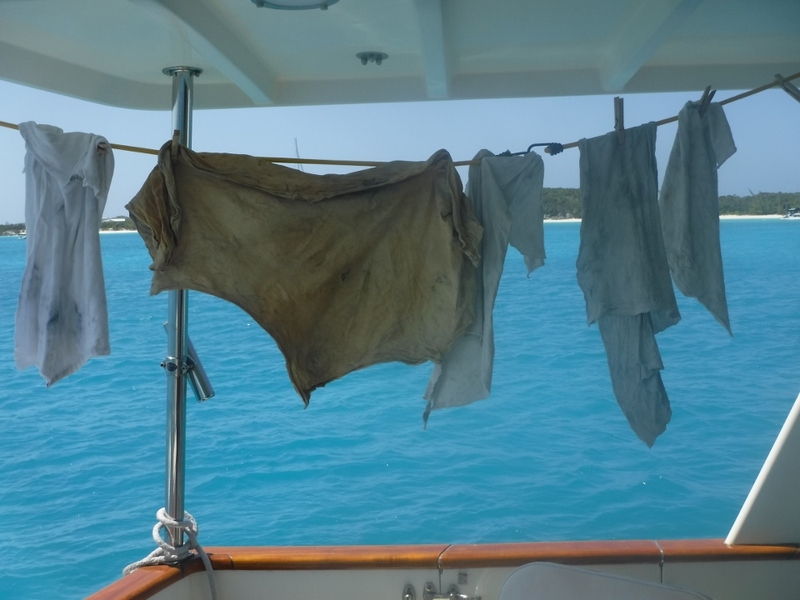 The next day we were joined by a pair of DeFevers who were travelling through the Exumas together – Escape, a 49 raised pilothouse and Aries, a 44+5. We would bump into them a couple more times. We stayed at Norman’s for a couple of days, then decided to head south to Big Majors and start to slowly make our way to Georgetown to pick up our next guests. As we got back out to the Exuma Bank we were surprised by how much wind and waves there were. If we had known how bad it was we would probably have stayed at Normans until it blew over. Again we had to run the boat from the pilothouse. Soon after starting off a cupboard door flew open in the galley and all the plates and bowls came tumbling out. Since they are plastic it wasn’t the disaster it could have been, only one smashed bowl. After about an hour of pounding the waves Paul, watching the rear-facing camera on the monitor in the pilothouse, saw our dinghy floating away from the boat. The tow rope had snapped in half. Paul quickly turned Sonas, and managed to lay her against the dinghy so that the waves held us against it. Using a boat hook we were able to grab the stern rope we also had on the dinghy, and walk the dinghy back to the swim platform. As Sian held the stern line Paul was able to grab what remained of the tow line at the dinghy’s bow and the piece still attached to Sonas and connect them using a reef knot. 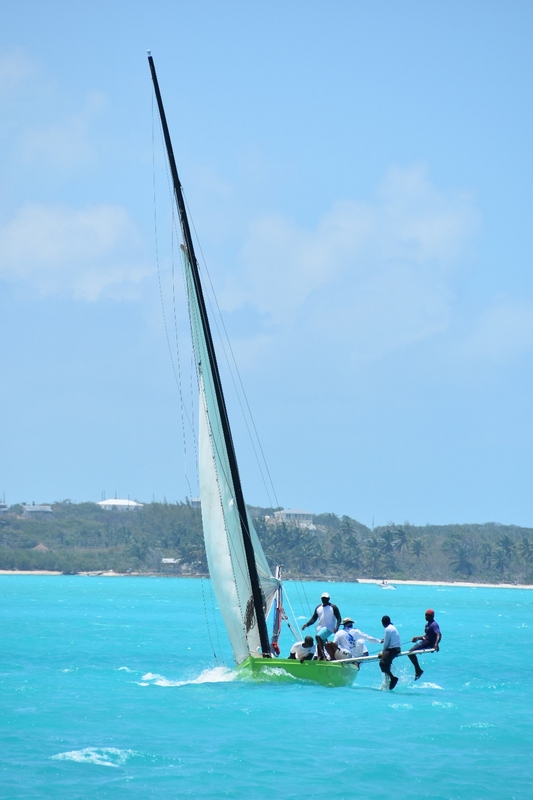 With that done we got back on course again, hoping that the knot held! About thirty minutes later the red warning light came on indicating that our stabilizers were overheating due to the work that they were doing in the seas. Enough was enough so we made the decision to turn into the nearest cay, which happened to be Emerald Rock again, and lick our wounds! Because the winds turned south during the night it blew straight into the anchorage and we had a pretty torrid and bumpy night – but safe. Poor Grace could not get ashore to do her business, eventually having to sneak away to the bow of the boat and go there. The next morning we got the news that Tom (of Tom and Jane from Elizabear who we met and visited with at Black Point) had a stroke the previous day. He was fast-boated to Nassau and then emergency flighted to Miami. We have not yet had an update. Since the weather had moderated slightly we continued on to Big Majors. When we got there the anchorage was very rough so we went through a very narrow opening between Big Majors and Fowl Cay and anchored behind Fowl Cay in what turned out to be a calm well sheltered spot – and with another nice beach for Grace to visit! While we were there we dinghy’d over to Staniel for some Kalik and Captain Morgan rum – which Paul has become very fond of! 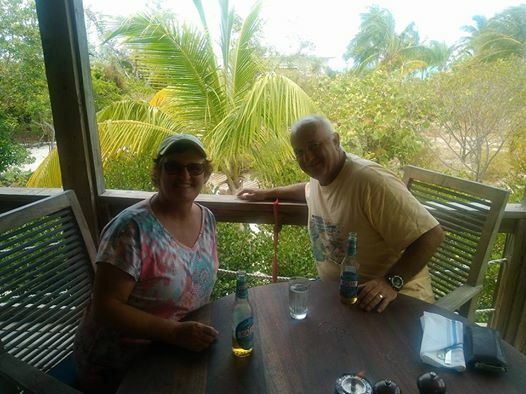 We also went to the Staniel Cay Yacht Club for lunch. It was Tuesday and exactly one week from the arrival of our guests in Georgetown. 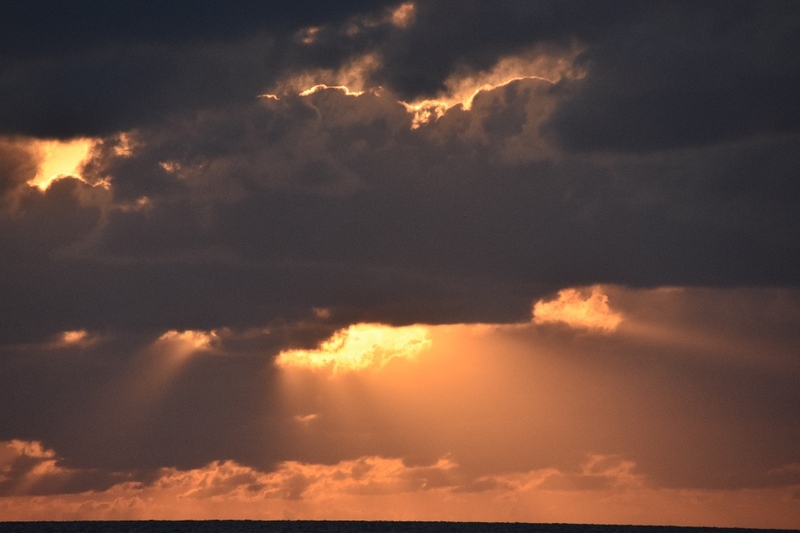 The forecast YET AGAIN was calling for high winds (and seas) Friday through Sunday. Since we would have to go out into the deep Exuma Sound to get to the harbour we decided to get there on Thursday to avoid the bad weather. So we aimed for Cave Cay as a half-way point. The cruisers guide also said that there was a nice grotto to be visited. We got there and went over to the “grotto.” Suffice to say Sian’s description was “a grotty grotto.” It was simply an indentation in the limestone rock, and the water was green and murky. That night, guess what, storms rolled through with plenty of thunder, lightning and rain. The next day we decided to make the run to Georgetown. We saw a couple of sailboats going out through the cut. Paul waited for 15 minutes then radioed them to get a read on the conditions. We were told that they were seeing three-foot waves. Sounded OK. Bob on Mint Julep radioed us and said that they were anchored nearby and were also going to go out and head for Georgetown. So off we went. The first sign of trouble was a standing wall of water at the mouth of the cut. We hammered through that (later finding out that we had a seat cushion blow overboard at that time). We tried staying close to land, but the seas were building, so we headed further east to find deeper water to see if the conditions would improve. We got to five-hundred feet but the seas did not change. We kept in touch with Mint Julep who were also getting pounded. These were more like six to seven foot seas on the nose, no three footers as reported. After about an hour Mint Julep radioed to say that he was turning back. He was only going down to Georgetown to watch the regatta that was being held, so had no pressing need to endure four hours of pounding seas. We decided to go on as the conditions were forecasted to get even worse through the weekend. There was nothing unsafe, and Sonas was handling everything well, it was just severely unpleasant. About one hour out from Georgetown and Elizabeth Harbour we saw a small cruise ship. Looking ashore at Emerald Bay/Steventon there were hundreds of tents up on the shore. We later found out that this was where they were holding the Fyre Music Festival, which from all accounts was a disaster and had to be cancelled after everyone had arrived. Around 4pm we entered Elizabeth Harbor. We crossed immediately to Georgetown and found a nice anchorage off the town. Because it was Thursday, the day the supply boat comes in, we hit the market and re-provisioned with fresh veggies, fruit and lots of milk!!! The next day we hit the booze store for beer, wine and, yes, a couple of bottles of Captain Morgan! 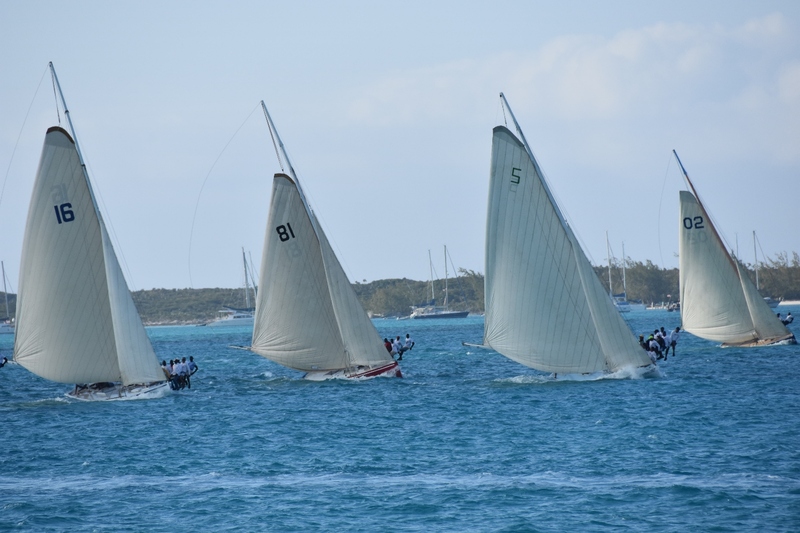 Over the weekend we watched the Bahamian Family Regatta races, which are an amazing sight. 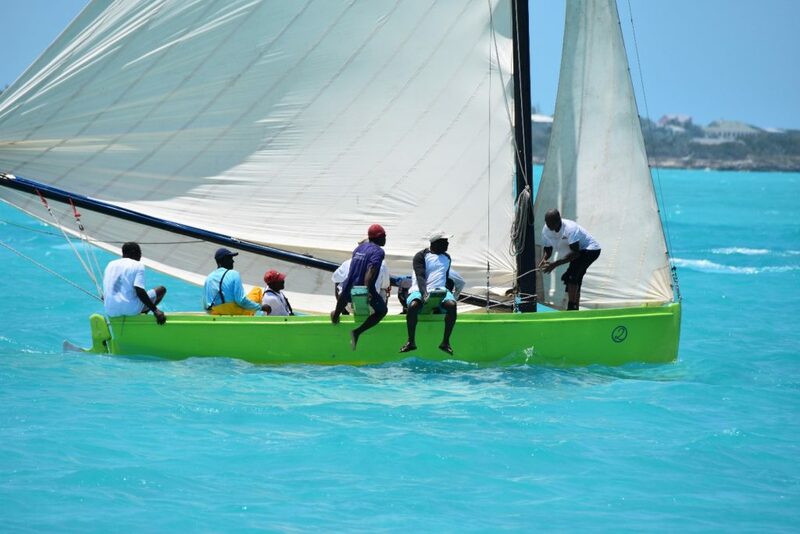 The colors of the boats and the number of people on planks holding the keel even – as many as 13 or 14 on board! We later crossed the harbour and anchored off Sand Dollar beach. From there we went to Chat n’ Chill for their Sunday pig roast dinner. We also took the opportunity to give the boat a scrub and get rid of the salt that covered her outside and the sand that had been tracked inside! On Tuesday John and AnneMarie arrive and we will immediately head north again! The great news is that the forecast for the next ten days call for winds under ten miles per hour and nothing but sun, sun and more sun! Happy days! Pilothouse: An enclosed area at the front of the boat from which we can navigate. We have big windows with wipers and air conditioning in there if necessary. Flybridge (in full flying bridge): An open area on top of the boat where there are a second set of controls from which to run the boat. VPR: Visual piloting required. This is where the charts do not care to have designated waypoints usually because of multiple challenges such as shifting sand, coral heads etc. Therefore we need to navigate the boat by sight. Love reading your posts. Have you all in our thoughts and prayers, especially your new friends on Elisabear. Thanks Lydia and Dan, see you all in about a month! Loved reading about your adventures. 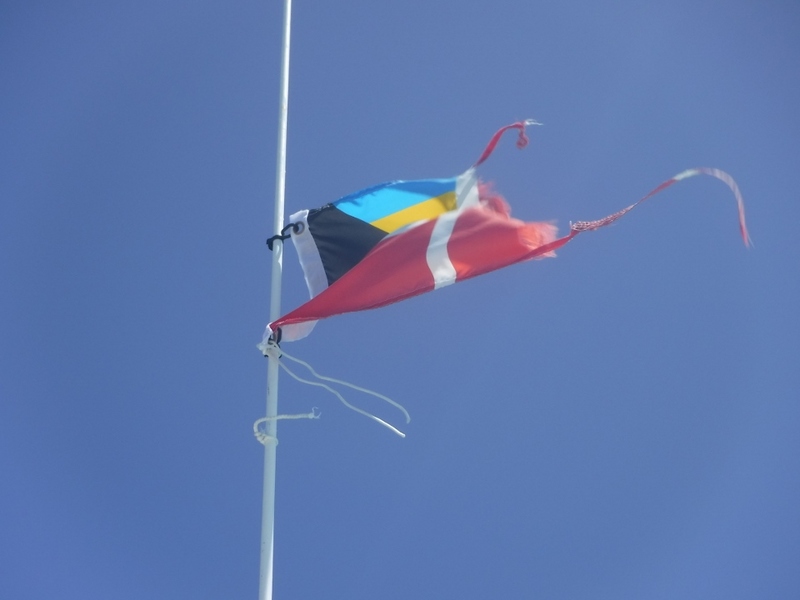 What of your Exumas trip would you have done differently if you could? Different time of year? Dinghy towing system? Despite your challenges, it was an excellent adventure – well done!